It's been at least 15 years since I last went to Biba. It was time for another visit. I set it up and six of our Meetup group went for a lovely dinner on a Monday night. Biba is in the same location and still even looks just as I remember it. Hopefully there's been a coat of paint, lol. Seriously, though, it is bright and cheerful versus some other restaurants that are on the dark side. It still has a very tasteful elegance with beautiful flower arrangements and crisp white linens. So nice to walk into after walking through the dust and diverted traffic from the construction just outside its doors. Laura and I were there first and took a seat in the bar to wait for the others. They had a pianist playing the baby grand piano, even on a Monday night. The bartender came out from behind the bar to serve us. All very nice. We were escorted to a nice round table at a corner of the restaurant. During the evening I was surprised to see the place pretty much full - for a Monday! We did see Biba come out to greet some bigwig at the next table. Years ago on my last visit, she had come around and visited each table individually. At the time of this dinner I am in the middle of a two-week detox diet. I haven't eaten carby foods, sugar, salt, fat, or dairy in seven days. But I had this already scheduled and had to try and pick the best thing I could off the menu. That meant I would have to at least take in the fat and salt for a night and probably consume more than my allotted size of protein for the day. Oh well. Besides, I was a Biba's! I had to make the most of it. I started with a small plate of the sweetbreads. Sweetbreads are the thymus glands of lamb, beef, or pork. They are one of those items that had been on my "to try" list for years and when I had them, I really liked them. At Biba they were sauteed with smoked pancetta in a limoncello sauce. One of the best things about sweetbreads is that they are so tender, they just melt in your mouth. After being completely fat free for a week, the silky saltiness of the pancetta grease was to die for. I was in heaven. 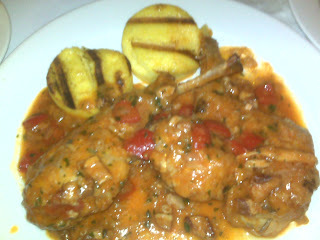 For my entree, I chose the rabbit and vegetables, hold the polenta. It was braised in a roasted bell pepper, tomato, balsamic vinegar and fresh herb sauce. As you see, it was a generous portion with plenty of sauce. My veggies were delivered on the side, green beans and tomatoes. The rabbit was nice and tender and the sauce was full of flavor, a little too much. It was very salty. Of course, I've also been salt free for a week. But Carol had also ordered the rabbit and found it salty as well. It did not decrease my enjoyment of the dish though. I had to be a good girl and pass on dessert. 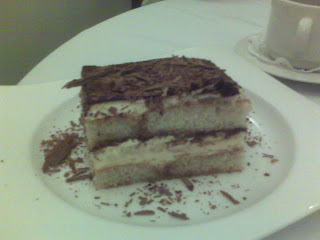 Laura was the only one who had a dessert there and she chose the tiramisu. I've never been a fan myself, but I will say that the slice was large and both Laura and Carol said that it was "light as air". Our server had been great as well. She was pleasant and fun with a good memory for our orders. She checked on us just the right amount, not being too intrusive or too neglectful. As for price, I had always considered Biba to be on the high end of local restaurants. Actually it wasn't too bad. My sweetbreads were $13 and my rabbit was $29, and that was one of the highest priced entrees. So it's not a terrible stretch on the pocketbook. I enjoyed my meal and only wish I could have had the added benefit of bread, pasta, and dessert. Guess that means I'll have to come back another day, just not fifteen years down the road.